Sold by Warehouse105 and ships from Amazon Fulfillment. Based on a true story, a prosecutor fights to prove the innocence of a man accused of murdering a minister. 4.0 out of 5 starsThe Boomerang comes back! Good news: this title is being rereleased in September 2008! A truly apt title indeed. We'll finally be be able to fill that annoying hole in the Fox Film Noir series on our shelves. As I recall this is a very good title, in the upper-tier of films noirs, but not quite into the top-tier (like Woman in the Window, Double Indemnity or Night and the City). It's been quite some time since I saw it (on TvO Saturday Night I seem to dimly recall or perhaps PBS), but my usually reliable memory indicates this should be a most enjoyable re-viewing. The last crop of Fox Film Noir was not the most substantial of the series (Black Widow is somewhat entertaining a times, but not really noir and rather slight). The 3 titles scheduled for early September mark a clear increase in terms of quality and pertinence. Now if only Fox would finally reissue Lang's Manhunt, which they've been labelling as Coming Soon for ages. Excellent cast . One Dana Andrews best performances. Andrews was a very underrated actor in my opinion and made some of my favorite movies. 4.0 out of 5 starsDana Andrews as always is a treat to watch! This is typical Film Noir type movie. Very enjoyable! All Dana Andrews movies are. It could have been priced a little better! I love old movies and try to collect as many as I can. This is one of the good ones. I enjoy old film noir and I'm aware of the more obvious classics (Maltese Falcon, Laura, Out of the Past, etc.). Beyond that, I'm not old enough to know so I have to research and read ratings by others on places such as Amazon. I recently ordered 4 more, based on great reviews by customers. IMO, this film is good but not great, and definitely not a classic in the same league as the above mentioned films. The acting is not as good or convincing and the plot is rather obvious and lacks the usual twists. This is a movie to rent, not necessary to own. As for the DVD itself, the transfer and sound quality are fine, about the same as others in this series. The DVD contains the film and some other promo trailers. Not much else in terms of bonus features, just like the others in these series. much betteras above also all other movies following are all havinf 4 stars to my opion. 5.0 out of 5 starsThis DVD was recalled! Very unfortunately, this DVD has been recalled, and it is not scheduled for re-release (and probably never will be). Copies did get out to the public and were for sale for a very short while before the recall, and I was lucky enough to get a copy. 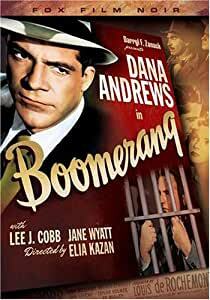 "Boomerang" is a great docudrama, taut and tense, directed with typical expertise by Elia Kazan. Based on a true 1940's murder of a local reverand in a small Connecticut town, "Boomerang" follows the subsequent investigation and trial of the murder suspect, as well as the agendas of a number of townspeople who want the case brought to an end. Shot on location in Connecticut, this film is a prime example of 20th-Fox "noir" at its best. "Boomerang" was scheduled for a VHS release a number of years ago, and was abruptly cancelled just before its scheduled release date. Some of the people appearing in the movie were townspeople, not professional actors, which certainly added to the authentic look and feel of the film. I have heard that their legal agreements did not include a VHS or DVD release - I don't know if that's true, but could certainly explain the problematic rights situation. Watch for a copy and get one if you can! The DVD is beautifully produced, with a very fine print of the film, and some interesting extras, including a commentary. A FOOTNOTE (Added August 2008): "Boomerang" is now scheduled for a re-release on DVD next month, 2 years after the recalled edition. Let's hope there's no further issues with the DVD. This is a "must" for any film noir collection.